JunoWallet, the nation's #1 promotional gift card application available to iPhone and Android users, has taken another leap forward by introducing "Social Gifting" to its industry leading mobile gift card platform. Last week JunoWallet announced it had launched the JunoPoints loyalty program, through which JunoWallet users can earn 20 JunoPoints or more every time they check into a Foursquare merchant (retailer, restaurant, and so forth) who has "GoneLive" with the JunoPoints program. 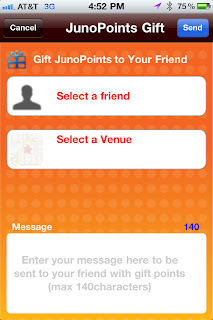 When a user accumulates 10,000 JunoPoints at that specific "Live" merchant, they earn a $100.00 gift card from the venue using those JunoPoints honored at that venue for all purchases. With its JunoPoints program, JunoWallet has monetized Foursquare check-ins and added a social gifting environment for consumers to engage with merchants around a loyalty program with tangible rewards. Merchants can "GoLive" by going to the dashboard at www.junowallet.com or by contacting Cindy Kurman at (312) 651-9000 or cindy@junowallet.com. Now, with the new JunoWallet version 6.1, JunoWallet users can "gift" their JunoPoints to other JunoWallet users and vice versa, helping each other to earn their $100 gift cards much sooner. "It is the first ever loyalty program that allows and encourages users to share and trade JunoPoints to help their friends get to the promised reward. Now users can actually get the carrot associated with a loyalty program instead of just chasing it-and their friends can help," said Chris Sweis, Chief Mobile Officer. "We hope to create a dynamic Social Gifting environment where friends are monetizing their loyalty and using JunoPoints to earn gift cards from their favorite venues." 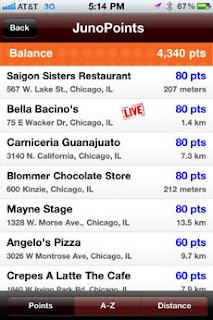 For example, if an out of town visitor to Chicago checks into a "live" Chicago coffee shop to buy a morning cup of Joe, he or she will earn 20 JunoPoints by checking in via Foursquare or JunoWallet. However, since the traveler may travel to Chicago only infrequently, he or she may not accumulate enough JunoPoints to earn the $100 gift card. Now, the traveler can "gift" those JunoPoints to a Chicago friend who can accumulate enough points to get the $100 gift card. Similarly, the Chicago friend can return the favor by "gifting back" JunoPoints that the traveler could use back home at a "live" merchant. 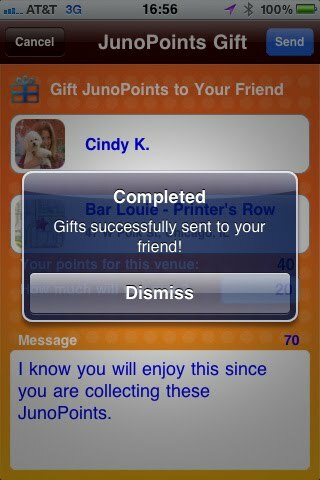 The new social gifting capability also means that friends can team up to share a tangible reward. They could, for example, choose a "designated JunoPoint recipient" and send all of their individually earned JunoPoints at a particular "live" venue, such as a restaurant, to that designated recipient, keeping the process going until that person has 10,000 JunoPoints. Then they can all go to the restaurant together to share in the $100 gift card reward. "It will become a peer-to-peer activity that pays off in real rewards and reinforces the concepts of brand engagement and community," explained Sweis. "That's what Social Gifting is all about." 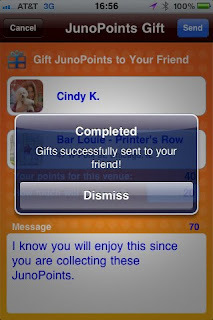 JunoWallet is a free mobile gift card app available for download by iPhone and Android phone users (and by Blackberry users in the near future). Once these smart phone users download the JunoWallet app and set up their JunoWallet account, they have access to a wide range of free promotional gift cards and gift certificates offered by a growing list of retailers, restaurants and other businesses. The gift cards stay on the smart phone and do not have to be printed out to be redeemed. For additional information regarding JunoWallet, visit www.junowallet.com, contact cindy@junowallet.com or download JunoWallet for your iPhone or Android today. JunoWallet is headquartered out of San Jose, CA and Chicago, IL. JunoWallet is a free mobile application and is available for download from the iPhone App Store and Android Market. JunoWallet is the number one gift card app for both iPhone and Android users with market penetration in the USA, Canada, UK, Ireland, Mexico, Australia, and Japan. With more than $700 million dollars worth of promotional gift cards, JunoWallet offers users an incentive to try out mobile gift cards for their favorite merchants everywhere. With its patent pending technology, JunoWallet offers businesses the ability to start a mobile media gift card campaign within 5 minutes and, with a single click, push the campaign to Android and iPhone users worldwide. JunoWallet can be fully integrated and ready for use by any business in any country worldwide. For more information, visit www.junowallet.com or call 312-651-9000.